Early SPIERS of AYR dovetailed steel, coffin-shaped smoothing plane that has been repaired at some point in its life. The original lever cap has been changed and the rear handle has had a repair. Both done a long time ago and neither effect the use of the plane. 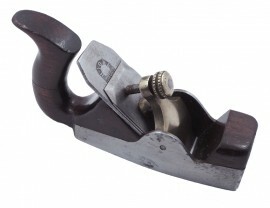 The plane has a super thick parallel iron by H. York which is cast steel and probably original. Rosewood infill. 2 1/4" wide blade. BARGAIN ! !